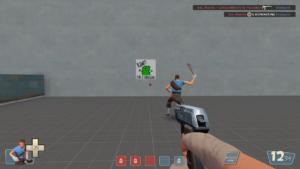 I bumped into an interesting post in the Team Fortress 2 Subreddit about tutorials. No, this is not about TF2 Trading. We are going back to the basic of tutorial and what Mami_ , the original poster, thinks of it. I have one major gripe with the tutorials everyone is suggesting, and that is that it makes the game a pretty tough one to get in to. Think of this; all of us have learnt on our own accord to rocket jump, sticky jump, use certain weapon combos, do certain movement techniques like sentry jumping and so on. The reason we learnt those things is because we spent hundreds if not thousands of hours mastering every single thing this engine has to offer. When I first started playing, I stayed because it was a very comfortable game to get in to. I wouldn’t have kept playing this game if I had to waltz through an entire single player game before I could even try multiplayer. In turn, I think that the current tutorial isn’t actually terrible or anything. It misses a few key things of course. It doesn’t teach airblasting, crouch jumping and all those things. But should it really teach those things. Isn’t it worth it for players to experiment like we did when we just started out? Summarized, I think that we should not over-convolute the tutorial. It could quickly make this game look like some impossible monolith to master. Even though it actually is, making it look like one could definitely scare players away. Mami_ is right. Tutorials aren’t supposed to be difficult to understand because they should be friendly to new players taking on the game. They don’t even know that there are TF2 Items in the game. So, keep it as simplest as possible guys.